If you’re new to these reports, let me give you a very brief background: I started these reports in January of this year and plan to post a report each month to outline my income, expenses, and traffic numbers for each month. I’m also using it as a way to focus on a new thing each month and then report back my findings. These reports have already helped me immensely AND it’s helped me connect with a lot of other bloggers which I absolutely LOVE. 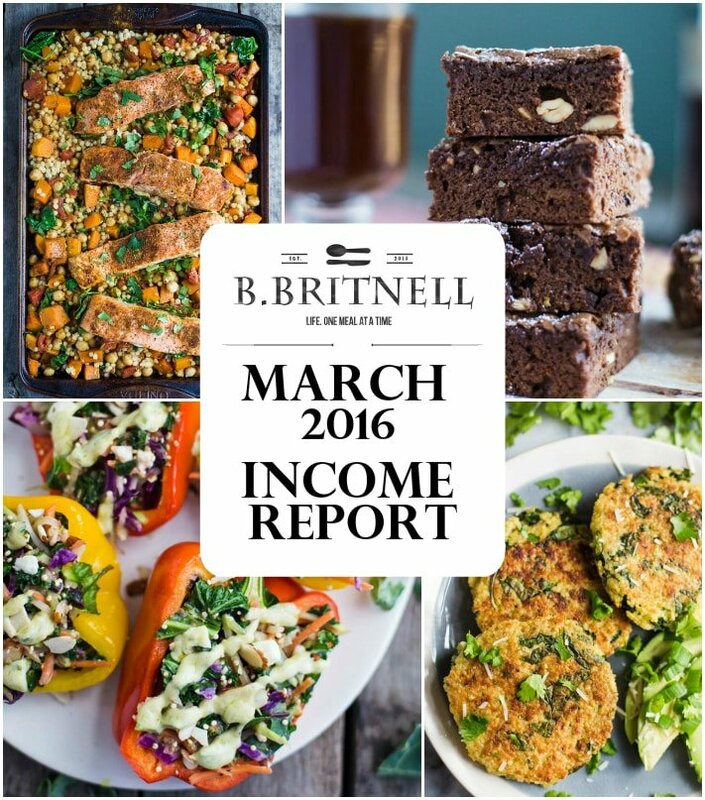 The most interesting thing to note for the month of March is that traffic was down by 25% (wompwomp) but my income was up by 241% (!!!!!!). Let’s dive into the numbers a bit more. Traffic was down by quite a bit this month which was kind of a bummer. I didn’t hustle NEARLY as much as I did in February and it certainly showed. I focused very heavily on creating content and developing new recipes but then I failed to really share those recipes after hitting publish on my blog. I’ve always heard the anecdote that you should spend 20% of your time developing recipes and 80% of your time sharing them and promoting them. Last month I basically flipped those numbers and, again, it really showed. Right now I’m working on a workflow chart that outlines everything I do (or should do) with each recipe from recipe testing to photographing all the way to listing each place (facebook, foodgawker, etc) that I want to share it. I’m putting this in a spreadsheet so that I can easily track the progress of each recipe. I’m really hoping that having a clearly outlined path for each recipe will help it get from point a (my brain) to point b (in front of lots of peoples’ screens). I’ll report back how that is going. I’ve heard a lot of bloggers reporting that after seeing a big dip in their Pinterest traffic, they’re finally seeing referrals from Pinterest going back up. I’ve noticed this as well over the past few weeks. 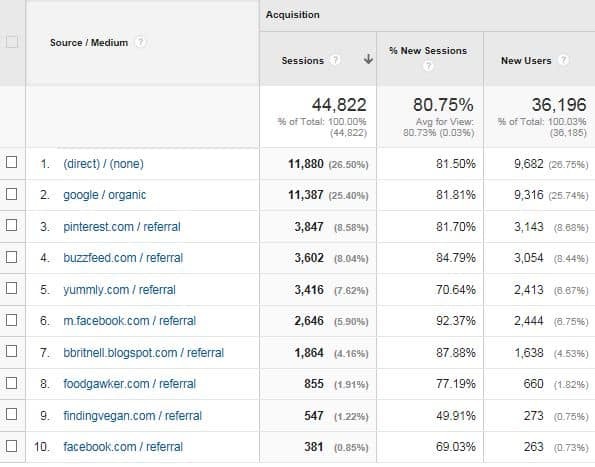 For March, Pinterest was my number three source of traffic with buzzfeed and yummly being close behind. Some of the links below are affiliate links. All of the products and services listed are ones that I use on a regular basis and highly recommend. If you have any questions about any of these, shoot me an email. This amount reflects ONLY the jobs that I obtained as a direct result of my blog. See note below. This money comes from various Amazon affiliate links that I have throughout my posts. One of the biggest things (although pretty small) that I’m proud of in the month of March is the increase in my Amazon affiliates income. While it’s only $22, it’s also a 1047% increase from what I made last month and I’m really proud of that. I’ve been working on inserting amazon links very organically and in a way that isn’t too pushy (I hope!). Glad to see that paying off even if just a little. *I’m not including any of the money that I make via my food photography UNLESS the photography job comes about as a direct result of my blog. I want to keep these reports focused on the money that I make from my BLOG and since I consider my photography business something separate, I’m not including those numbers here. I currently only expense food that I actually photograph for the blog and not food that’s just part of recipe testing. As I hope you know, I released my first ebook this month. I hired a good friend of mine (who is an amazing designer!) to design the ebook for me. I’ll talk more about that later. I’ve been wanting some new surfaces for my photography so I finally broke down and ordered one of these faux tabletops from Erickson Woodworks. My expenses were rather high this month since I bought the new faux tabletop and spent a bit more on food due to the freelance photography work that I did. I also made the decision to pay a designer for my ebook instead of doing it myself. I’m not sure what it is but I am HOPELESS at anything design. Just designing the lead image for this post took me about an hour. I’m SUPER happy that I decided to pay someone to design my ebook for me. I honestly don’t think that it would have ever gotten done if I was designing it myself. I think that my designer did an AMAZING job and she was such a delight to work with. If you’re in need of some design work, I highly recommend her! Shoot me an email and I’ll send you over her contact info. Hosting. I love my web host BUT I pay A LOT compared to what I see others paying. This is something that I’m looking at possibly changing soon. Let me know if you have any good suggestions for hosts! My main focus for the month of March was getting my ebook finished. 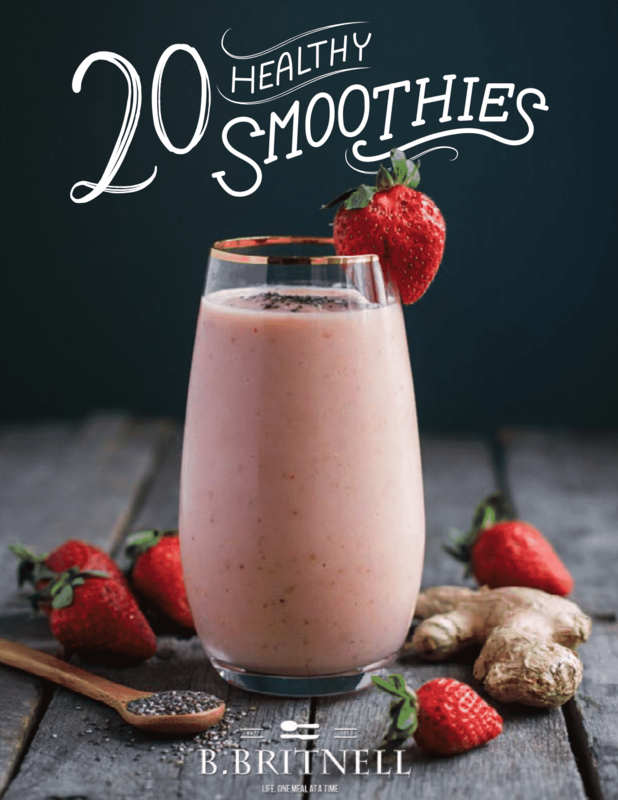 It’s a compilation of 20 healthy smoothie recipes. A few of these recipes are on my blog but most of them are new recipes that I developed over the past few months. After chatting with a fellow Nashville blogger, Caitlin from Grass Fed Girl, she recommended that I work on growing my email list and that I release a free ebook as an incentive for people to sign up for my newsletter. She has around 20k email subscribers so I jumped on her advice and got busy making my ebook right away. I’m very grateful that she encouraged me to do this and I’m SO happy with how it turned out. If you have any questions about my process in formulating the ebook or publishing it, I would love to chat! I very much enjoyed the process! Thanks to you for visiting my blog, I have been able to sponsor a young girl in Haiti again this month. My plan is to continue donating 10% of everything that I make from my blog. I’m grateful for this opportunity to give back, even if just a little for now. Super impressed by your blog income – way to go!!! I can recommend MediaTemple for hosting. They have FANTASTIC support. I think they’re still on the pricey side at about $200/year, but that’s still better than what it looks like you’re paying. Thanks for the recommendation, Sara! I definitely need to figure out my hosting situation asap! Were you pleased with the increase in subscribers from the ebook? I just signed up and thought it was really clever that you’ll send out a new smoothie recipe monthly to subscribers! I didn’t see as big of a boost in subscribes as I thought I would but it was definitely an substantial increase and I’m really glad that I did it! Posted on Good article but to assume Stan Lee’s word is anything but hype is a mistake. It was and still is Marvel company policy to state that Stan Lee "created" characters he generally never drew nor wrote stories of before artists brought pages into the office telling their first stories to avoid lawsuits with artists, primarily S …Lauran Mildrum liked The Norse Mythology Blog: BLOND THOR: STAN LEE WASN’T WRONG | Articles & Interviews on Norse Myth on 22 June 2012 (4 months ago). This was SO good. They went off with Al when he left for work yesterday and not a single one came home! Apparently, he only even got half of one because someone stole the rest of his when he wasn’t looking. That’s pretty telling.